Share the post "IFNH Student Ambassador Alumna Presents “Cooking on a Budget” for Price Family Fellows"
Students in the Price Family Fellows program and IFNH Student Ambassadors gather in the Food Lab to get a taste of cooking healthy meals on a budget. Taylor Palm (wearing “R” shirt), led the demonstration. It’s not every Friday night students gather in the Davison Hall Food Lab on the Douglass Campus to learn how to cook delicious and nutritious meals on a budget, but on January 27 that is exactly what took place. 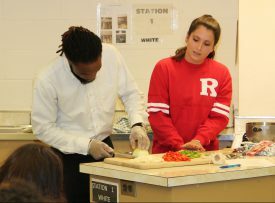 Taylor Palm (SEBS ‘16), an IFNH Student Ambassador alumna, who is currently a dietetic intern at Sodexo and pursuing a Masters in nutrition at University of Rhode Island, held a “Cooking on a Budget” demonstration for students in the Price Family Fellows program. The Fellows program, offered by the Rutgers School of Social Work, supports Rutgers students who are current or former foster care youth. The Fellows receive personalized assistance in maximizing their academic, career, financial, and personal goals and have access to support venues, including taking part in life skills workshops. The cooking demonstration provided students with an opportunity to learn an important life skill— how to prepare easy, nutritious and cost effective meals at home. Taylor Palm provides Seph Williams (SAS ’18) guidance on proper cutting technique. The evening started off with the best part of any cooking demonstration— eating! The catering division of Rutgers Dining Services prepared recipes to reflect the foods in the demonstration. This way, the students could have a better understanding of what the recipes would actually taste like. After enjoying a delicious dinner of vegetarian chili over brown rice, sweet potato and black bean veggie burgers, whole wheat BBQ chicken pizza, and a sweet potato, chicken and veggie hash, Palm illustrated just how easy it was to make these delicious recipes. 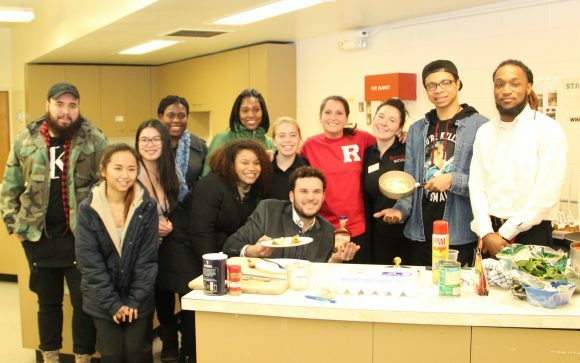 With the help of IFNH Student Ambassadors Carly Harris (SEBS,’18) and Brenda Borba (SEBS ’17), Palm walked the students through all four recipes while using her knowledge of nutrition to explain why these recipes were not only delicious, but healthy. The focus on plant-based proteins, whole grains, and putting a healthy spin on favorites (like pizza), sparked plenty of questions from the students, which Palm happily answered. A few students volunteered to participate in the cooking process by learning how to properly slice an onion, chop a pepper and mix veggie burgers. Palm channeled her inner Food Network star, which made learning about cooking on a budget entertaining and enjoyable. All the students shared lots of laughs and insightful commentary. Overall, the event was a great success for all involved.